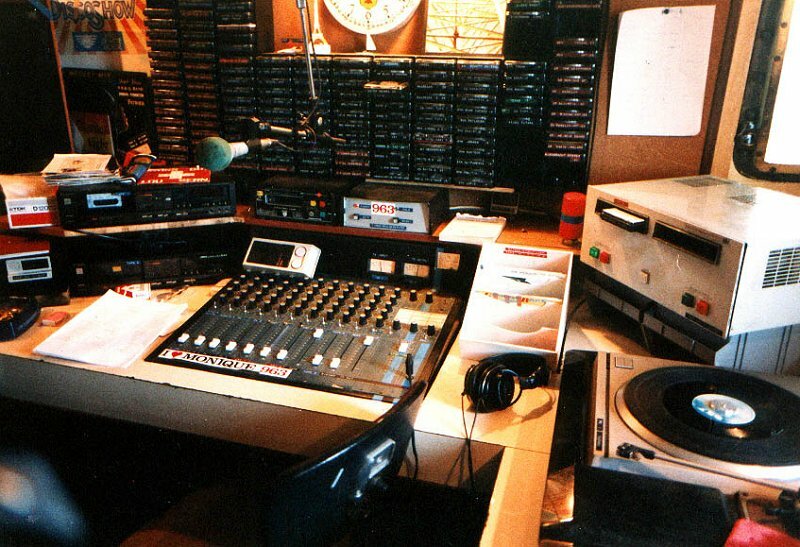 In the autumn of 1984 Radio Monique found themselves looking for a new platform to broadcast from and approached Ronan O' Rahilly for the possibility of sharing Studio's and Transmitters with Radio Caroline, onboard Ross Revenge. With a programming format aligned to a Dutch speaking audience - promoting Dutch artists, and having the backing of both recognised recording companies in Holland and the Canadian Lotto 64/9, Ronan entered into contract with Radio Monique enabling them to provide a Dutch language service from the ship. Radio Monique were also fortunate to have the backing of a number of Belgium and Dutch businessmen, most notable Lucv an Driessche, Director of the popular Topic Magazine. In true Caroline style the emergence of Radio Monique was kept under close wraps, but it wasnt long before speculation and rumours turned into reality. On 15th December 1984 Radio Caroline's two frequencies, 576kHZ (519m) and 963kHZ (312m), were now carrying both Radio Caroline (519) and Radio Monique (312) respectively. Radio Monique's arrival on the Ross Revenge didn't quite go exactly to plan. In December 1984 extremely bad weather resulted in generator and transmitter problems, together with storm damage to the 300ft aerial - preventing both Caroline and Monique from broadcasting, albeit intermittently, between December 1984 and January 1985. A Force 10 gale on 6th January resulted in Ross Revenge dragging her anchor at which point the emergency services were alerted, and transmissions were temporarily shut down. Thankfully, Ross Revenge was able to sail under her own steam back to her previous anchorage accompanied by the Walton on the Naze lifeboat. The problems however did not end there. Whilst Radio Caroline were able to return to air, damage caused by the extreme weather prevented Radio Monique from resuming their broadcasts. After a relatively trouble free six months broadcasting from the Ross Revenge, Radio Moniques's woes were set to return in the form of the UK Governmnet DTI surveillance vessel 'Diptric Surveyor' which anchored roughly between Ross Revenge and The Communicator (Laser 558's Radio Ship), with the express intention of preventing tendered supplies reaching either ship. And the Dutch authorities determination in taking Radio Monique off air. Unlike the UK Government, the Dutch authorities chose to take action against Radio Monique back on land by targetting suppliers and those involved with advertising and promoting the station. These actions proved successful to the Dutch authoritites by essentially cutting off much needed supplies and financial support. January 1986, and by now both Radio Caroline and Radio Monique were starting to feel the pinch of the authorities' interference. Monique in particular were increasingly being starved out of financial support from their backers, but also delivery of much needed new material to broadcast to their listeners was being hampered by the authorities. 30th January 1986 and the Ross Revenge and her crew were yet again subjected to bad weather - this time in the form of a Force 8 gale whilst anchored in the Knock Deep, just outside of UK territorial waters. With a broken anchor chain the Ross Revenge drifted some 10 miles, close to the Tongue Lightship, placing her inside territorial waters. On this occasion the Sheerness Lifeboat came to the rescue escorting Ross Revenge back to her previous anchorage where the ship's emergency anchor was brought into action. 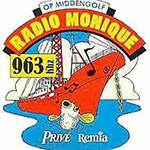 Whilst Radio Caroline were able to resume broadcasting (on 558kHZ) relatively quickly, the Radio Monique transmitter remained silent for a couple of days after - resuming service on 963kHZ on 2nd February. On the evening of October 15th 1987 a hurricane caused extensive damage across southern England, with Ross Revenge finding herself in the path of the storm. Suprisingly, given that vast areas of the south east suffered devastation, Ross Revenge encountered what appeared at the time to be only minor damage - enabling both Radio Caroline and Radio Monique to continue broadcasting. With exception to a few outages, transmissions continued relatively unhindered until the latter part of November 1987. 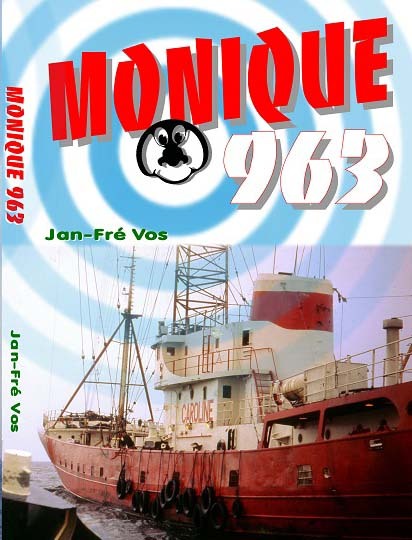 In the interim between October and November Radio Monique were forced to change from their 693kHZ frequency to 819kHZ due to Finnish radio station, Radio Yleis, broadcasting on the same frequency with much stronger transmissions. 24th November 1987 saw another storm hit Ross Revenge. Although not as ferious as the previous October hurricane, the storm caused signifcant damage to both the Diplexer and the 300ft mast, resulting in the mast collapsing - and signalling the end of Radio Monique's broadcasting period from the Ross Revenge.